Stop Emissions! A climate scientist argues that it should no longer to acceptable to dump carbon dioxide in the sky. 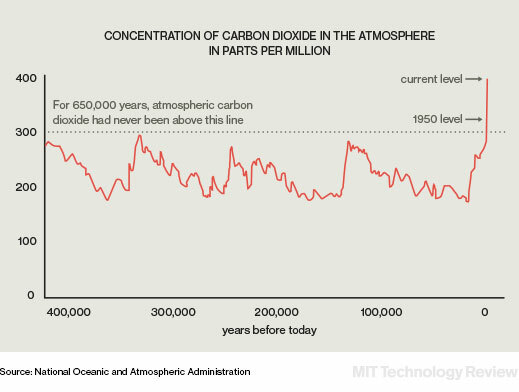 Caldeira, K., 2015: Stop Emissions! A climate scientist argues that it should no longer be acceptable to dump carbon dioxide in the sky. MIT Technology Review [Available online at http://www.technologyreview.com/featuredstory/543916/stop-emissions/]. Many years ago, I protested at the gates of a nuclear power plant. For a long time, I believed it would be easy to get energy from biomass, wind, and solar. Small is beautiful. Distributed power, not centralized. I wish I could still believe that. My thinking changed when I worked with Marty Hoffert of New York University on research that was first published in Nature in 1998. It was the first peer-reviewed study that examined the amount of near-zero-emission energy we would need in order to solve the climate problem. Unfortunately, our conclusions still hold. We need massive deployment of affordable and dependable near-zero-emission energy, and we need a major research and development program to develop better energy and transportation systems. It’s true that wind and solar power have been getting much more attractive in recent years. Both have gotten significantly cheaper. Even so, neither wind nor solar is dependable enough, and batteries do not yet exist that can store enough energy at affordable prices to get a modern industrial society through those times when the wind is not blowing and the sun is not shining. Recent analyses suggest that wind and solar power, connected by a continental-scale electric grid and using natural-gas power plants to provide backup, could reduce greenhouse-gas emissions from electricity production by about two-thirds. But generating electricity is responsible for only about one-third of total global carbon dioxide emissions, which are increasing by more than 2 percent a year. So even if we had this better electric sector tomorrow, within a decade or two emissions would be back where they are today. We need to bring much, much more to bear on the climate problem. It can’t be solved unless it is addressed as seriously as we address national security. The politicians who go to the Paris Climate Conference are making commitments that fall far short of what would be needed to substantially reduce climate risk. Four weeks ago, a hurricane-strength cyclone smashed into Yemen, in the Arabian Peninsula, for the first time in recorded history. Also this fall, a hurricane with the most powerful winds ever measured slammed into the Pacific coast of Mexico. Unusually intense storms such as these are a predicted consequence of global warming, as are longer heat waves and droughts and many other negative weather-related events that we can expect to become more commonplace. Already, in the middle latitudes of the Northern Hemisphere, average temperatures are increasing at a rate that is equivalent to moving south about 10 meters (30 feet) each day. This rate is about 100 times faster than most climate change that we can observe in the geologic record, and it gravely threatens biodiversity in many parts of the world. We are already losing about two coral reefs each week, largely as a direct consequence of our greenhouse-gas emissions. Recently, my colleagues and I studied what will happen in the long term if we continue pulling fossil carbon out of the ground and releasing it into the atmosphere. We found that it would take many thousands of years for the planet to recover from this insult. If we burn all available fossil-fuel resources and dump the resulting carbon dioxide waste in the sky, we can expect global average temperatures to be 9 °C (15 °F) warmer than today even 10,000 years into the future. We can expect sea levels to be about 60 meters (200 feet) higher than today. In much of the tropics, it is possible that mammals (including us) would not be able to survive outdoors in the daytime heat. Thus, it is essential to our long-term well-being that fossil-fuel carbon does not go into our atmosphere. If we want to reduce the threat of climate change in the near future, there are actions to take now: reduce emissions of short-lived pollutants such as black carbon, cut emissions of methane from natural-gas fields and landfills, and so on. We need to slow and then reverse deforestation, adopt electric cars, and build solar, wind, and nuclear plants. But while existing technologies can start us down the path, they can’t get us to our goal. Most analysts believe we should decarbonize electricity generation and use electricity for transportation, industry, and even home heating. (Using electricity for heating is wildly inefficient, but there may be no better solution in a carbon-constrained world.) This would require a system of electricity generation several times larger than the one we have now. Can we really use existing technology to scale up our system so dramatically while markedly reducing emissions from that sector? Solar power is the only energy source that we know can power civilization indefinitely. Unfortunately, we do not have global-scale electricity grids that could wheel solar energy from day to night. At the scale of the regional electric grid, we do not have batteries that can balance daytime electricity generation with nighttime demand. We should do what we know how to do. But all the while, we need to be thinking about what we don’t know how to do. We need to find better ways to generate, store, and transmit electricity. We also need better zero-carbon fuels for the parts of the economy that can’t be electrified. And most important, perhaps, we need better ways of using energy. Energy is a means, not an end. We don’t want energy so much as we want what it makes possible: transportation, entertainment, shelter, and nutrition. Given United Nations estimates that the world will have at least 11 billion people by the end of this century (50 percent more than today), and given that we can expect developing economies to grow rapidly, demand for services that require energy is likely to increase by a factor of 10 or more over the next century. If we want to stabilize the climate, we need to reduce total emissions from today’s level by a factor of 10. Put another way, if we want to destroy neither our environment nor our economy, we need to reduce the emissions per energy service provided by a factor of 100. This requires something of an energy miracle. Most of the growth in emissions this century is expected to come from the world’s developing economies, eager to give their impoverished populations basic health care, education, and meaningful work. Can we in the rich world really ask that people in poor countries allow another child to go hungry or another person to die from a treatable disease rather than use fossil fuels to power their economic growth? We can say that the richest countries should pay the cost differential between carbon-polluting and non-carbon-polluting energy systems for the poorer countries, but right now we can’t even get people in most of the rich countries to pay this cost differential for themselves. How can we get environmentally friendly energy systems that can compete on price with coal or natural gas? We need more incentives. The cost reductions in wind and especially solar over the past decade stemmed mainly from many small process improvements that came about as these technologies were more widely deployed. But many near-zero-emission technologies will cost more than coal or natural gas. Unless there is a tax or price on carbon dioxide emissions, there will be no markets for the innovations that a research and development effort can provide. While there is much merit to the idea of a revenue-neutral carbon tax, it would make sense to allocate some of that tax revenue to clean-energy R&D. Some people hope we might develop technologies that could remove the carbon dioxide we have emitted into the atmosphere. It’s feasible, but it seems to me to be a technological pipe dream. It is always going to be easier and cheaper to avoid making a mess than to clean up one we have already made. It is easier to remove carbon dioxide from a smokestack, where the exhaust is 10 percent carbon dioxide, than from the atmosphere, which is 0.04 percent carbon dioxide. Sure, planting trees and spreading biochar—a soil enhancer that sequesters carbon—may be good things to do; we just shouldn’t fool ourselves into believing that doing those things will solve our climate problem. Despite all these reasons for despair, I am hopeful. What leads me to believe that humanity can solve such a thorny problem requiring collective action on a global scale? When the Constitution of the United States of America was written, it seemed inconceivable that people would be released from slavery or that women would vote. Just a few years before gay marriage became the law of the land, it would have been impossible to predict such a sweeping change in social attitudes. For us to even have a chance of addressing the climate problem, we’ll need another huge change in public attitudes. It will need to be simply unacceptable to build things with smokestacks or tailpipes that dump waste into the air. This change could happen. The agreements made in Paris will be helpful, but they’re like changing over to compact fluorescent lightbulbs: nice, but insufficient to the scale of the task. However, the attention brought to the climate problem at the highest levels of government represents an important step toward a social tipping point—to that phase change when we decide collectively that we are not going to use the sky as a waste dump. Ken Caldeira is a climate scientist in the Department of Global Ecology at the Carnegie Institution for Science at Stanford University.